The story behind Carnevale di Venezia (translation: Carnival in Venice), began years ago when Michael wandered into one of the many mask shops in Venice, Italy. In Michael's words, "I was fascinated by a traditional Venetian mask called 'Bauta'. I purchased this mask then, with the intention of one day working it into a painting. The mask (which was the very first thing I painted as I began this work), can be seen on the figure in the foreground, holding the skull. This painting is also an homage to one of my favorite Artists, Caravaggio, specifically his 1606 work, St. Francis in Meditation". 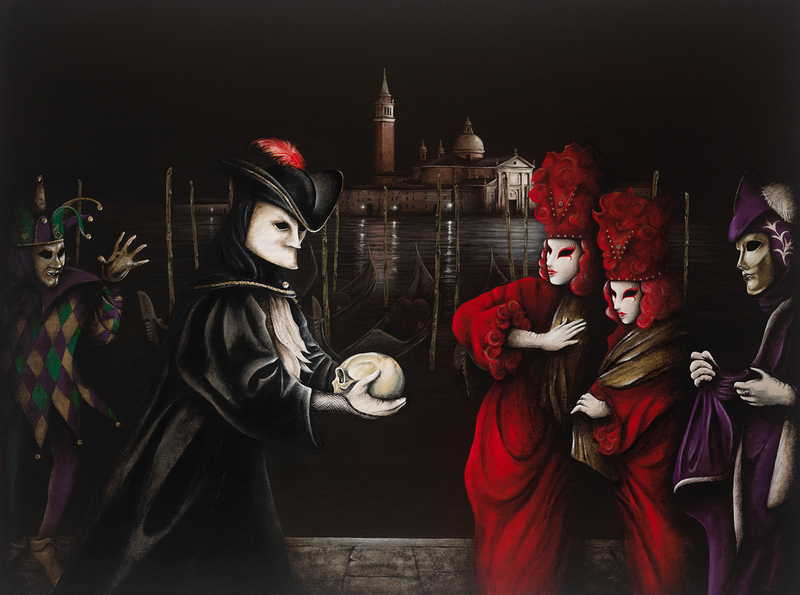 Carnevale di Venezia is being offered as a giclée on canvas print, with a limited production of 75 signed and numbered pieces. The canvas measures 30" x 40".